The subtle changes of color in this yarn bring to mind an undersea forest of gently swaying kelp. A fun introduction to modular knitting, this scarf is easy to work in garter stitch segments, with each new block growing out from the edges of its neighbors. 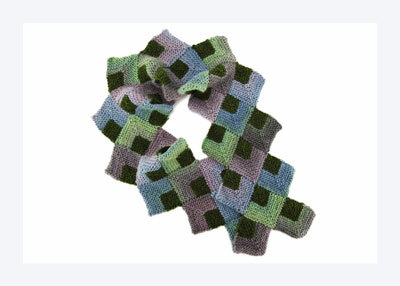 1 ball each of MC and CC will yield 18 squares, or about 21″ of scarf length. The amount of yarn specified will yield a 42″ scarf. Purchase more yarn and make more blocks if you’d like a longer version. Follow the chart for the order of block construction. First make Blocks 1 and 2, then join them with Block 3. Blocks 4 and 5 are joined to Block 3, and so on, to the desired length. With MC, CO 25 sts using cable CO method. Row 2 (RS): Sl1, k10, sl1, k2tog, psso, k10, p1 — 23 sts. Row 3: Sl1, knit to last st, p1. Row 4: Sl1, k9, sl1, k2tog, psso, k9, p1 — 21 sts. Row 5: Sl1, knit to last st, p1. Row 6: Sl1, k8, sl1, k2tog, psso, k8, p1 — 19 sts. Row 7: Sl1, knit to last st, p1. Row 8: Sl1, k7, sl1, k2tog, psso, k7, p1 — 17 sts. Row 9: Sl1, knit to last st, p1. Row 10: Sl1, k6, sl1, k2tog, psso, k6, p1 — 15 sts. Row 11: Sl1, knit to last st, p1. Row 12: Sl1, k5, sl1, k2tog, psso, k5, p1 — 13 sts. Row 13: Sl1, knit to last st, p1. Row 14: Break MC and attach CC. Sl1, k4, sl1, k2tog, psso, k4, p1 — 11 sts. Row 15: Sl1, knit to last st, p1. Row 16: Sl1, k3, sl1, k2tog, psso, k3, p1 — 9 sts. Row 17: Sl1, knit to last st, p1. Row 18: Sl1, k2, sl1, k2tog, psso, k2, p1 — 7 sts. Row 19: Sl1, knit to last st, p1. Row 20: Sl1, k1, sl1, k2tog, psso, k1, p1 — 5 sts. Row 21: Sl1, knit to last st, p1. Row 22: Sl1, sl1, k2tog, psso, p1 — 3 sts. Row 23: Sl1, knit to last st, p1. Row 24: Sl1, k2tog, psso — 1 st. Break yarn, leaving st live for reuse. Work Block 2 as for Block 1. With A, knit through live st from Block 2. 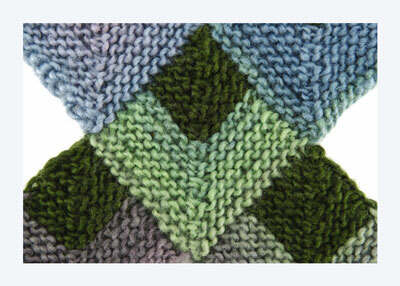 Pick up and knit 11 sts along upper-left edge of Block 2, then 1 st from CO edge of Block 2. Pick up and knit 11 sts from upper-right edge of Block 1, then knit through live st at top of Block 1 — 25 sts. Continue working as for Block 1. With MC, knit through last live st of Block 3. Pick up and knit 11 sts through upper-left edge of Block 3, then 1 st through last st of Block 1. Turn work. Using cable CO method, CO 12 new sts — 25 sts. With MC, CO 12 sts using cable CO method. Pick up and knit through last live st of Block 2. Pick up and knit 11 sts along upper-right edge of Block 3. Knit last live st from Block 3 — 25 sts. 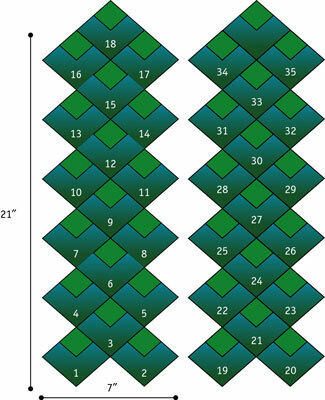 Work remaining blocks: All rem blocks (6 through 35) are worked as for Block 3, 4, or 5, depending on their position in the scarf (see diagram). 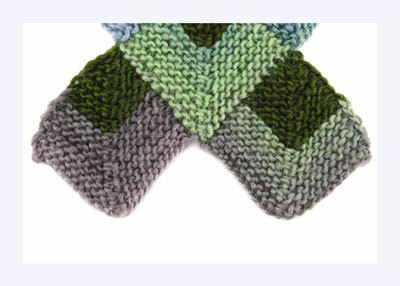 Continue making blocks until scarf reaches desired length, ending with 2 side blocks. Weave in ends. Steam lightly to block. The slipped stitches at the beginning and end of each row of knitting form a tidy edge through which it is easy to pick up new stitches. For the neatest look, place the tip of your needle under both “legs” of each slipped edge stitch when picking up.